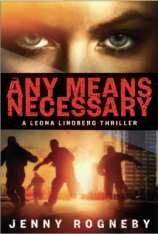 ANY MEANS NECESSARY is a must-read for fans of thrillers and/or general fiction. Jenny Rogneby is a Swedish criminologist and a former criminal investigator with the Stockholm City Police Department. Her Leona Lindberg series puts a new twist on the police procedural genre. Leona, like her creator, is with the Stockholm police and is leading a double life. However, the manner of their alternative existence is quite different. While Rogneby is an author in civilian life, Leona divides time between her duties as a police officer and her occupation as a criminal, using separate skills, information access and abilities to seamlessly maneuver between both worlds. LEONA: THE DIE IS CAST, the opening installment of the series, was a total gobsmacking surprise, complete in itself while setting up the tools for the sequel. Now that ANY MEANS NECESSARY is here (thanks in great part to a fine translation by Agnes Broome), readers can see that LEONA was anything but a fluke. "Rogneby gives several eye-opening lessons on how to be a successful criminal or, at the very least, reduce one’s risk of failure. It’s all extremely entertaining, with the criminal lessons actually presenting some advice transferable to the legitimate world as well." It is not necessary to have read the first book before delving into this one. As with the best of the series, Rogneby gives newcomers all they need to know about what has gone before without stutter-stepping the new narrative. ANY MEANS NECESSARY finds Leona attempting to maintain her police job while pulling off large-scale robberies. Regarding the former, she is called in when a terrorist blows himself up just outside of the Parliament House in Stockholm. He miraculously survives but is remarkably closemouthed as to his agenda. While investigating him by day, Leona uses her evenings to establish a night school course of sorts for criminals, instructing them on how to choose and execute jobs for maximum payoff with minimal risk. The classes constitute an income stream for Leona, as well as a recruitment pool for a job she is planning in order to pay off Armand, the ruthless master criminal to whom she is deeply in debt and for whom she will do anything to collect. Meanwhile, Leona tries to balance both sides of her life (and not so successfully) with caring for her young daughter, Beatrice, and dealing with her ex-husband, Peter. As the bombing investigation becomes more involved, Armand presses his own demands for payment, using Beatrice as a fulcrum. Then her investigation reveals a connection with her personal life, and the complexity of the heist she is planning grows one hundredfold. Furthermore, she has no idea how close she is to potentially being betrayed on all fronts. As the book rockets to a startling conclusion, Leona will have to call upon all of her skills, knowledge and deviousness to escape with what she requires. At the end of the day, her talents may not be enough. The novel is a bit of a slow burn that saves the majority of its sinus-clearing thrills for the last quarter of the story. But reader interest will not lag one bit, as Rogneby gives several eye-opening lessons on how to be a successful criminal or, at the very least, reduce one’s risk of failure. It’s all extremely entertaining, with the criminal lessons actually presenting some advice transferable to the legitimate world as well. ANY MEANS NECESSARY is an enjoyable ride that you won’t want to miss.